The last two years of the Journal Project, we were only allowed to send in one piece, 17"w x 22" tall, and tell its story. The whole thing had gotten sort of out of hand and was taking up a lot of the quilt show floor acreage, probably, but I am sad that we were limited to this. Anyway, my piece was of my son, Justin who worked (?) in India on and off for two years for Mr. Ratan Tata and his friend, Mr. Siva, at their various resorts and spas. He was Mr. Tata's personal trainer, but spent most of his time lounging around the pool while Mr. Tata was busy working. Justin graduated from the University of San Francisco as Philosophy Student of the Year, so I show him here, working hard (? ), reading a book called The Meaning of Life, and the name of the piece is "Life is a Beach." The last year, I experimented with some fabric printing on the computer. The scene in the back is a scene of the Oregon coast, printed onto two sheets of Printed Treasures fabric. The overlay of Justin and Alana and the candles and the words were printed on ExtravOrganza, and fused to the background. This is bordered with batiks, and hand embellished with rain falling from the clouds. Oh, it was sad to see the last of the Journal Quilts, but at least we have the Journal Quilt Book to reminisce about them. This is the photo I started with. 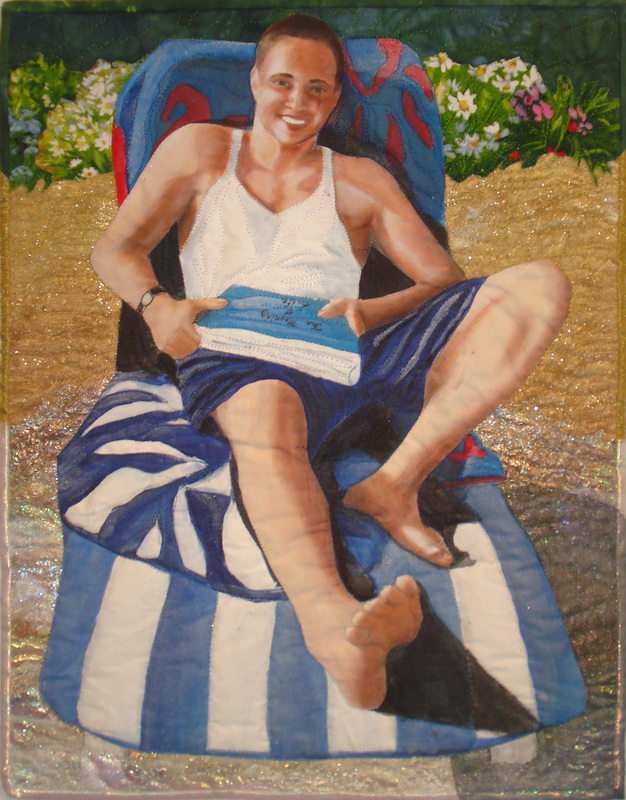 As you can see, he was in a lounge chair at the pool, but I thought it much more interesting to put him on the beach, which is actually fabric covered with Puff Paint, sprinkled with sand and glitter, heated, then painted. This is the photo for the overlay, that was printed onto ExtravOrganza.